This week’s Friday Fragments has, very conveniently, been put off till Saturday which means I didn’t have to be incredibly rude and spend part of Christmas Day hiding away behind the laptop in order to participate. Of course just because I didn’t have to have net time yesterday doesn’t mean I stayed completely away…. I’m so addicted. Head on over to Half-Past Kissin’ Time for more fragments from the festive season. Our camping trip to Fingal Bay last weekend kicked off to a great start with us stuck in a traffic jam on the freeway, we took 2.5 hours to travel about 5km. I was able to get online from my phone and find out that the reason for the jam was a caravan accident, that there was a rescue helicopter on the road and that all lanes were closed. So we resigned ourselves to being late and were very grateful for cool weather, fully charged Nintendo DS’s and that it wasn’t us who’d managed to flip their huge caravan and have the roof of their 4WD removed (not sure if that was due to the accident or the rescuing). 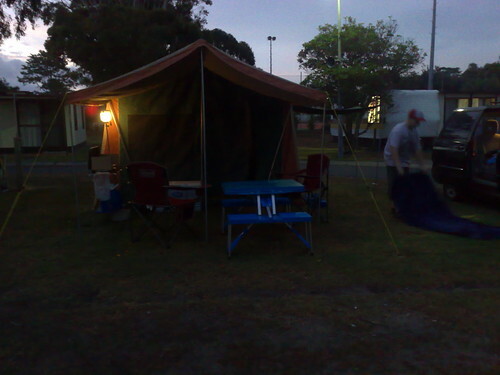 We arrived with just enough time up our sleeves to get the tent all set up before the light faded. This was about as big as the waves got. On Christmas Eve we went to Adam’s brother’s place for lunch. I made a Greek salad and a pear, blue cheese and walnut salad, and we took some prawns along as our contributions to the meal and we sat around eating and talking while the kids played in the swimming pool. 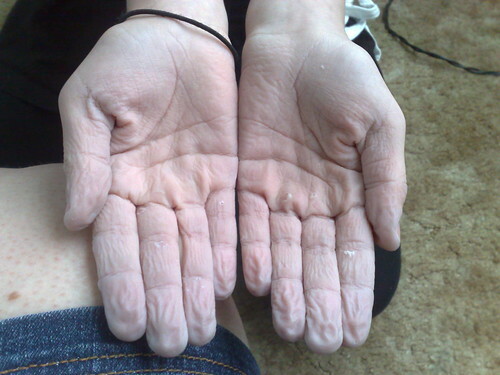 It’s possible Caitlin may have been in there just a little too long. Christmas lunch was at my Mum’s place and we were very happy that my 99 year old Grandma was able to join us. It was quite an effort for her to be there but she was glad to be there and, as I told her, it’s such a wonderful thing for the kids to know their Great Grandma and be able to share special occasions with her. As we sat around the table after the meal Caitlin ran off and grabbed her new sketchbook and Derwent pencils and drew a portrait of Great Grandma which she then gave to her to take home. I think it was a bit of a hit. 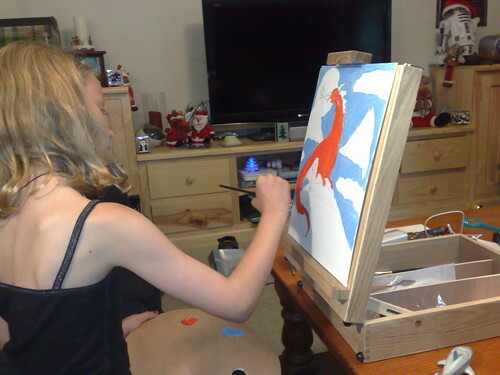 Caitlin scored big on the art front for Christmas, as well at the set of 72 Derwent watercolour pencils, she got a desk easel with paints, brushes, a palate and a couple of canvases, they seem to have gone down well. One of Tom’s presents was a drawing kit with a book on how to draw mythological creatures, this has been a huge success with Adam and Caitlin getting in on the act as well. This one is a collaborative effort between Tom and Daddy. Today we have eschewed all the traditional Boxing day pursuits of movie going, sales shopping, cricket or Sydney to Hobart yacht race watching and have spent the day lazing around doing nothing much. Adam did get a bit energetic for a while though and whipped up a loaf of Ginger Beer Bread using the Spiced Ginger Loaf recipe from our bread machine’s instruction book and using Lord Nelson Old Admiral beer in place of water. It was pretty damn good. 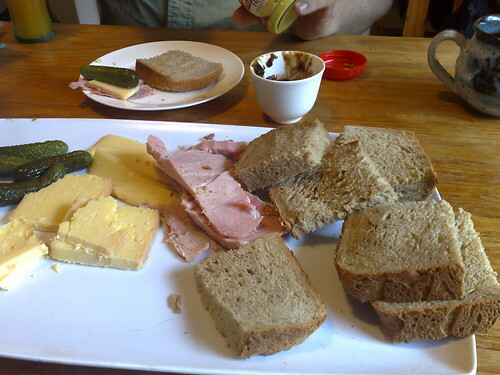 Bread, cheese, ham and pickles. Perfect. 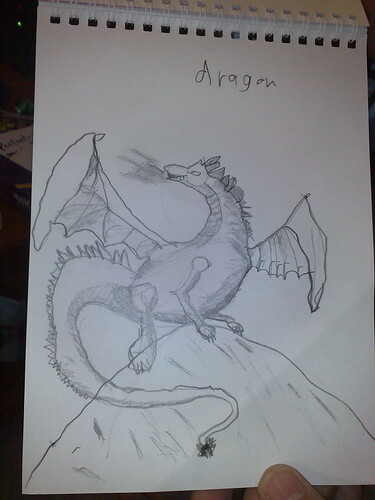 I just love Caitlin and Thomas's drawings of dragons. What budding artists you have Mim. I've never understood the urge to run about on Boxing Day. Surely it is just for lazing about, eating leftover ham, and checking out your Christmas books? I love people who can experiment in the kitchen like that and get great results. Yum…. Of course, drawing/painting skills, too–so wonderful! Glad your Christmas was nice. What a wonderful holiday! The dragon pics are wonderful! As you already read, we had our own accident that we came upon and were grateful that we only dealt with a minor traffic headache and no hospital visits or broken bones and cars and who knows what else. Caitlin is quite an artist! 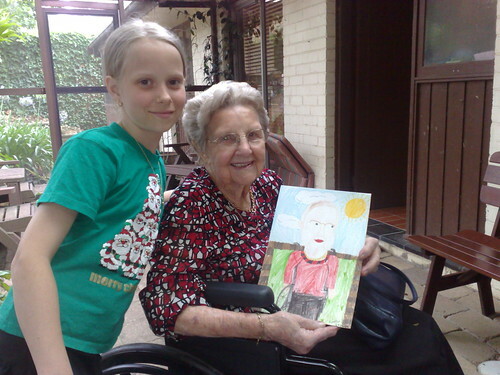 I love the portrait of Great Grandma. Sounds like your day was full and blessed. I am happy for you. That pic above looks SO good! Now I'm hungry. I think your boxing day lunch looks exactly the way a traditional boxing day should look. Yummy. It sounds like a fabulous holiday!